Recently, my wife discovered that the classic 1980’s television series MacGyver was available on our Netflix instant streaming subscription. For those who do not know, MacGyver was an hour-long show revolving around the adventures of Angus MacGyver, a secret agent working for the Phoenix Foundation. He would often find himself in tough situations that required cunning, resourcefulness, and his ever-present Swiss army knife to solve. The show was produced by Henry Winkler (the Fonz) and the lead character was played by Richard Dean Anderson. The show ran for almost 140 episodes and was praised for its focus on science and its avoidance of gunplay. It also had a maddeningly-catchy theme song composed by Randy Edelman. The Fashion – After getting through the first season I cannot imagine the racks of spare Member’s Only and leather bomber jackets the costume department had on hand to ensure Anderson’s character had something to wear. I was also impressed by MacGyver’s prominent use of flannel, which was years ahead of the grunge movement. The Females – I was always under the impression that the nickname “Mac” was simply an unimaginative abbreviation of his surname, but after watching several episodes it appears to take on a whole new meaning. 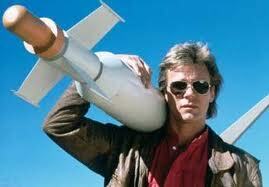 Perhaps it was his approachable demeanor or simply his ingenuity, but MacGyver had quite a way with the ladies. Being a family-oriented 80’s show the majority of the carnality occurs off-screen or is implied, but there is not a doubt in my mind that Phoenix Foundation would have been well-advised to spring for bi-monthly blood tests. And since his conquests rarely re-appeared on subsequent episodes, one can be fairly certain that his “mission objective” was not long-term emotional attachments. Objects of his mulletted-affections even included future starlets like Terri Hatcher and Tia Carrere. The Voice-overs – Long before Grey’s Anatomy and Desperate Housewives had turned disembodied narration into a cliché, Richard Dean Anderson would often begin episodes with fond recollections of his childhood. They would inevitably recall heartwarming fishing trips with his father or a camping excursion with grandpa. I always found this strange since these nostalgic moments rarely explained his ability to fabricate a surface-to-air missile from nothing more than a feminine hygiene apparatus and two pints of mouthwash. Villains – The series had several ambitious villains, who were nevertheless unable to overcome MacGyver’s ingenuity and distaste for outright violence. His most formidable nemesis was Murdoc, a murderous assassin played by British rocker Michael Des Barres. Murdoc was employed by the Homicide International Trust (HIT) as a varsity level “problem solver” whose schemes were always foiled by MacGyver. Like Jason Voorhees, he would always reappear after his apparent “demise” to wreak more havoc on the flabbergasted Phoenix Foundation. You would think after this happened nine times they would have personally pushed his body into a chipper-shredder to prevent any future resurrections. The Organizations – I have always wondered why they could not have put a little more effort into the faceless collectives that drive the MacGyver storylines. The Phoenix Foundation? Homicide International Trust? Are these violent charities? Are we to understand that monetary donations are tax deductible? I am also pretty sure that the key to avoiding prosecution when running a murder-for-hire business is to refrain from using the word “homicide” on the marquee (although I readily admit that the resulting acronym is deliciously subtle). The Science – Supposedly each and every episode contained accurate portrayals of scientific phenomenon that could be duplicated in a lab environment. Once the show’s audience grew, producers even solicited suggestions from fans as to how Mac could utilize his surroundings to get out of a jam. Although I have no applicable science background, I always wanted to submit a list of items for him to combine like moose tranquilizers and human lung tissue or submarine glue and bran muffins.